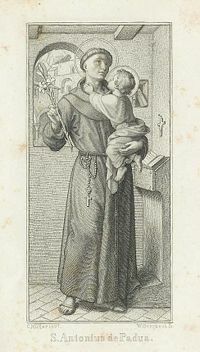 Saint Anthony of Padua (ca. 1195 – June 13, 1231) also venerated as Saint Anthony of Lisbon, is a Catholic theologian, preacher, and one of the church's most popular saints. He was born in Lisbon, Portugal as Fernando Martins de Bulhões to a wealthy family, and died in Padua, Italy. Anthony's life-long desire was to bring conversions of Muslims to Christianity. At about the age of 25, he set sail to begin his ministry, but fell ill shortly after arriving in Morocco and was forced to return home to heal. However, his ship was blown off course and Anthony landed in Sicily, where he discovered that he was also a brilliant preacher. Combining his skills with the gift of miracles, Anthony was recognized as one of the greatest foes of the heresies of his time. He converted many of these heretics, rich and poor, common and noble, to the faith, and was given the title "Hammer of the Heretics." Today, Saint Anthony of Padua is venerated today as one of the greatest Franciscan saints. Canonized in 1232, his Feast Day is June 13, and he is considered by the Catholic Church to be the patron saint of barren women, lost articles, the poor, and travelers. Anthony, then known as Fernando Martins de Bulhões, was born in a rich family who wanted him to live the life of a nobleman. His family arranged a good education for him at the local cathedral school. Against the wishes of his family, Ferdinand entered the Augustinian Abbey of St. Vincent on the outskirts of Lisbon. The Canons Regular (or, priests' rules) of St Augustine, of which he became a member, were famous for their dedication to scholarly pursuits. Ferdinand studied Scripture and the Latin classics. He was constantly visited by friends and relatives, who brought embarrassing gifts and news from their social world which disturbed him. His studies suffered and he found no peace. He persuaded his superiors to transfer him to the Augustinian Santa Cruz Monastery in Coimbra, then the capital of Portugal; and continued his studies there. After his ordination, Ferdinand was placed in charge of hospitality in his abbey. In this role, in 1219, he came in contact with five Franciscans who were on their way to Morocco to preach to the Muslims there. Ferdinand was strongly attracted to the simple lifestyle of the Franciscan friars. In February 1220, news arrived that the five Franciscans had been martyred in Morocco. Ferdinand meditated on the heroism of these Franciscans. Feeling God's call to leave everything and follow Him, Ferdinand obtained permission from his superiors to join the Franciscan order. In the summer of 1220, he was invested with the Franciscan habit and began to learn the teachings of their founder, Francis of Assisi. He took the new name of Anthony in honor of the early monk Saint Anthony the Great, to whom the Franciscan hermitage where he was living was dedicated. Shortly after, Anthony set off to Morocco with another friar. He intended to die preaching the Gospel there. However, upon his arrival in Morocco, he fell so ill he had no choice but to return home. On the return trip to Portugal, his ship was driven by a storm upon the coast of Sicily and he landed at Messina. From Sicily, he made his way to Assisi and sought admission into a monastery in Italy, but met with difficulty on account of his sickly appearance. He was finally assigned, out of pure compassion, to the rural hospice of San Paolo near Forli, outside Bologna, Italy. There he appears to have lived as a hermit and was also put to work in the kitchen. One day, on the occasion of an ordination when many visiting Dominican monks were present, there was a misunderstanding over who should preach. The Franciscans naturally expected that one of the Dominicans would occupy the pulpit, for they were renowned for their preaching; the Dominicans, on the other hand, had come unprepared, thinking that a Franciscan would be the preacher. In this quandary, the head of the hermitage, who had no one among his own humble friars suitable to preach for the occasion, called upon Anthony, whom he suspected was the most educated, and instructed him to speak whatever the Holy Spirit should put into his mouth. Anthony objected but was overruled, and his sermon created a deep impression. His rich voice and eloquence were moving, and the entire theme and substance of his discourse deeply moved his hearers. To Brother Anthony, my bishop (i.e. teacher of sacred sciences), Brother Francis sends his greetings. It is my pleasure that thou teach theology to the brethren, provided, however, that as the Rule prescribes, the spirit of prayer and devotion may not be extinguished. Farewell. 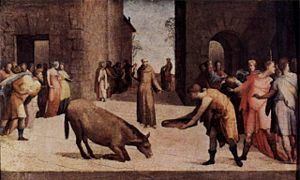 Another account indicates that Anthony was commissioned by Brother Gratian, the Franciscan provincial minister, to preach the Gospel throughout Lombardy in northern Italy. From then on his skills were used to the utmost by the Church. Occasionally he took another post, for instance as a teacher at the universities of Montpellier and Toulouse—both in southern France—but it was as a preacher that Anthony revealed his supreme gift. Before undertaking his task of preaching, Anthony went for some time to Vercelli, to confer with the famous abbot, Thomas Gallo; then he taught successively in Bologna and Montpellier in 1224, and later at Toulouse. Nothing whatever is left of his sermons and lectures; the primitive documents, as well as the legendary ones, are lost. Nevertheless, by studying his other works, the character of his doctrine fairly clearly, corresponds to the spirit and ideals of St. Francis. It was as an orator, however, rather than as professor, that Anthony reaped his richest harvest. He possessed all the good qualities that characterize an eloquent preacher: a loud and clear voice, a winning countenance, wonderful memory, and profound learning, to which were added from on high the spirit of prophecy and an extraordinary gift of miracles. With the zeal of an apostle he undertook to reform the morality of his time, by combating in a special manner the vices of luxury, avarice, and tyranny. He was equally as fervent in fighting against heresy, notably that of the Cathars and the Patarines, who were based in the center and north of Italy. Anthony probably dealt also with the Albigenses in the south of France, though we have no certain documents to that effect. The first is that of a horse, which, kept fasting for three days, refused the oats placed before him, till he had knelt down and adored the Blessed Sacrament, which Saint Anthony held in his hands. Legendary narratives of the fourteenth century say this miracle took place at Toulouse, at Wadding, at Bruges; the real place, however, was probably Rimini. The second is that of poisoned food offered him by some Italian heretics, which he rendered pure by the sign of the cross. The third is that of his sermon to the fishes on the bank of the river Brenta in the neighborhood of Padua. The zeal with which St. Anthony fought against heresy, and the great and numerous conversions he made, rendered him worthy of the glorious title of Malleus hereticorum ("Hammer of the Heretics"). In a synod at Bourges in the presence of many prelates, he reproved the archbishop, Simon de Sully, so severely, that Anthony reportedly induced him to change his ways. Preaching one night on Holy Thursday in the Church of Saint Pierre du Queriox at Limoges, he remembered he had to sing a Lesson of the Divine Office. Interrupting suddenly his discourse, he appeared at the same moment among the friars in choir to sing his lesson, after which he continued his sermon. At Saint Junien during the sermon, he predicted that by an artifice of the devil the pulpit would break down, but that all should remain safe and sound. The prophecy was fulfilled just as he predicted. In a monastery of Benedictines, where he had fallen ill, he delivered one of the monks from great temptations by means of his tunic. By breathing on the face of a novice, he confirmed him in his vocation. At Brive, where he had founded a convent, he preserved from the rain the maid-servant of a benefactress who was bringing some vegetables to the brethren for their repast. The Infant Jesus was also said to have appeared to Anthony. French writers maintain it took place in the province of Limousin at the Castle of Chateauneuf-la-Forêt, whereas the Italian hagiographers fix the place at Camposanpiero, near Padua. We have more certainty regarding the apparition of Saint Francis to Saint Anthony at the Provincial Chapter of Arles, while the latter was preaching about the mysteries of the Cross. In 1226, after attending the Franciscan chapter at Arles, France, and preaching in the French region of Provence, Anthony returned to Italy and served as envoy from his community to Pope Gregory IX. At the papal court, his preaching was hailed as a "jewel case of the Bible" and he was commissioned to produce official sermons for Feast Days. Anthony was elected provincial minister of the Italian region of Emilia-Romagna on May 30; the friar, held out against the relaxation in the requirements of the austere Franciscan lifestyle. Anthony became ill with dropsy and, in 1231, went to the woodland retreat at Camposanpiero with two other friars for a respite. There Anthony lived in a cell built for him under the branches of a walnut tree. 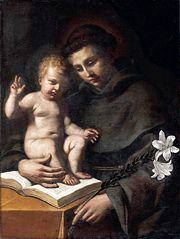 Saint Anthony died on June 13, 1231 at the Poor Clare convent at Arcella on the way back to Padua at the age of 36. When he died, it is said that the children cried in the streets, that all the bells of the churches rang of their own accord, and that angels came to earth to ring the bells for the death of the saint. 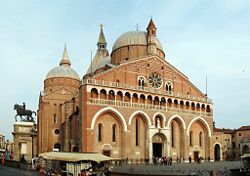 He is buried in a chapel (once a church, now enclosed by the current edifice) of the large Basilica of Saint Anthony in Padua. The house where he was born in Lisbon was turned into a church, the Igreja de Santo António de Lisboa. One of the most beloved of saints, his images and statues are ubiquitous. Proclaimed a Doctor of the Church on January 16, 1946, he is sometimes called the "Evangelical Doctor." He is especially invoked for the recovery of things lost ("Saint Anthony, Saint Anthony, please come around. Something is lost that can't be found."). Many important churches, as well as schools, hospitals, and even cities are named after Saint Anthony. In the U.S., on January 27, 1907 in Beaumont, Texas, a church was dedicated and named in honor of Saint Anthony of Padua. The church was later designated a cathedral in 1966 with the formation of the Roman Catholic Diocese of Beaumont, but was not formally consecrated. On April 28, 1974, Saint Anthony Cathedral was dedicated and consecrated by Bishop Warren Boudreaux. In 2006 Pope Benedict XVI granted Saint Anthony Cathedral the designation of minor basilica. St. Anthony Cathedral Basilica celebrated its hundredth anniversary on January 28, 2007. Seventeenth-century Spanish missionaries came across a small Native American community along with what was then known as the Yanaguana River on the feast day of Saint Anthony and renamed the river and eventually a mission built nearby in his honor. This mission would at first become the focal point of a small community that would eventually grow in size and scope to become the city of San Antonio. Attwater, Donald, & Catherine Rachel John. The Penguin Dictionary of Saints. Penguin Books, 1993. ISBN 0140513124. 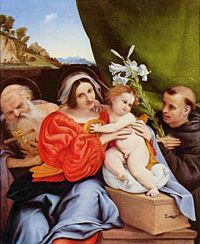 History of "Saint Anthony of Padua"
This page was last modified on 2 April 2008, at 15:45.